Rob Torres, Senior Compliance Consultant at Self Regional Healthcare, Greenwood, since September 2014, has been elected to Upstate AHEC’s board of directors. He will serve a four-year term, joining board members from Spartanburg, Greenville, Pickens, Anderson, Edgefield, Laurens and McCormick counties. Mr. Torres previously worked nine years as Executive Director for Performance Improvement, Risk and Compliance at Newberry County Memorial Hospital. During his tenure in Newberry, he served as chairman of the board of directors of Mid-Carolina AHEC. For more information, visit www.upstateahec.org. 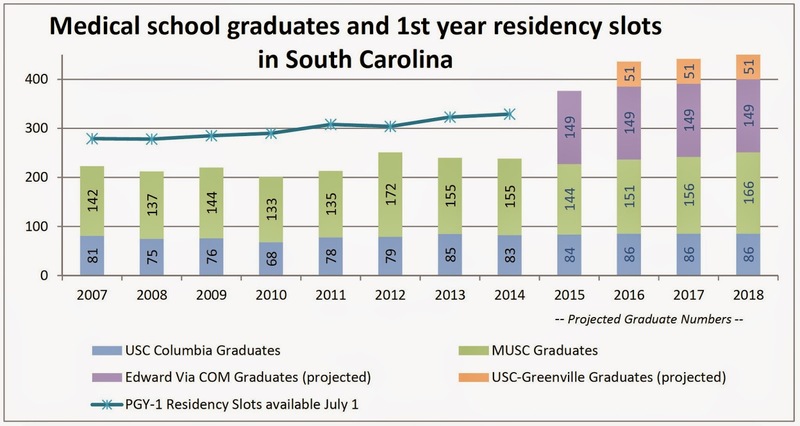 When physicians complete both their medical education and residency training in South Carolina, the great majority of them remain in the state to practice.1 Due to the creation of two new medical schools in the state in recent years, the Office of Healthcare Workforce Analysis and Planning expects a substantial increase in the number of in‐state medical school graduates beginning in 2015. The chart below illustrates the rapid growth in the number of medical school graduates expected in the next few years and the relatively slow growth in the number of residency program slots available for first-year residents. Data sources: Graduate counts from the various medical schools in South Carolina were obtained from the Integrated Postsecondary Education Data System for the years 2007 through 2013. Future years are estimates based on the number of first year enrollees reported to us by the schools four years prior to the graduation year, assuming a 92% completion rate. PGY1 (Program Year 1) residency slot counts are the quota figures for each residency training program in the state as reported in the National Residency Match Program Results and Data Report 2014 and Program Results: 2007 ‐ 2011. PGY1 slot counts prior to 2013 may not include a small number of positions reserved for osteopathic program graduates. 177% based on the 2012 AMA Physician Masterfile analysis by the Association of American Medical Colleges as reported in their 2013 State Physician Workforce Data Book, published November, 2013. For more information, please visit The Office for Healthcare Workforce Analysis and Planning website at http://www.officeforhealthcareworkforce.org. Pee Dee AHEC will welcome nationally known triathlete and lifelong renal patient Shad Ireland on March 5 as a guest speaker at the 2015 Renal Symposium: Understanding the Challenges of Renal Disease and Shaping the Outcomes for Future Generations. Mr. Ireland was diagnosed with diseased kidneys at age 11 and he underwent dialysis and two unsuccessful kidney transplants in subsequent years. Doctors told him that he would probably not live past age 25. In 1993, Mr. Ireland witnessed Julie Moss crawl to the finish line of the Ironman Triathlon. The finish inspired Mr. Ireland and he decided that he would be a triathlete one day. Though he weighed only 85 pounds at the beginning of training and could not walk on the treadmill for 20-seconds without becoming winded, Mr. Ireland began seriously preparing for the Ironman competition. He went on to become the first dialysis patient to complete the course in 2004. The symposium will also feature lectures from local renal care providers identifying ways to assist patients with renal disease, while protecting against and preventing further renal insufficiency whenever possible. For additional information, please contact Pee Dee AHEC CE Coordinator Cheryl Neuner, BSN, at 843-777-5347. Lowcountry AHEC will offer an Oncology Certified Nurse (OCN) Review Course on April 9 at Roper St. Francis Professional Development Offices in Charleston. The course will provide a high level overview of oncology nursing principles of practice to assist nurses with preparation for the Oncology Nursing Certification Corporation (ONCC) OCN examination. 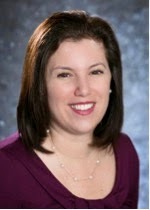 Michele Gaguski, MSN, RN, AOCN, CHPN, ARN-C will be the instructor and the program will offer 7.0 nursing contact hours. Please visit www.lcahec.com for further information and to register. Osteoporosis is a disease of the bones. It happens when you lose too much bone, make too little bone or both. As a result, your bones become weak and may break from a minor fall or, in serious cases, even from simple actions, like sneezing or bumping into furniture… About 54 million Americans have osteoporosis and low bone mass, placing them at increased risk for osteoporosis. Studies suggest that approximately one in two women and up to one in four men age 50 and older will break a bone due to osteoporosis. Sara M. Meeks, PT, NS, GCS, KYT, founder of the American Physical Therapy Association Section on Geriatrics Special Interest Group on Osteoporosis and author of Walk Tall! A Program for the Prevention and Treatment of Osteoporosis will be the presenter for the training program. For more information, please contact Pee Dee AHEC CE Coordinator Kay Lambert at klambert@mcleodhealth.org. The 2014 South Carolina AHEC Annual Report is here! Catch up on what AHEC accomplished last year on our website. Do you have an AHEC story to share? Send us your comments at mcmenami@musc.edu. For more information, visit www.scahec.net.